You MUST read our Scammer Allegation Response Page here BEFORE you read the ComplaintWire Responses below. The information on the Scammer Allegation Response Page will help you understand the reason why deliberately fictitious and malicious information was posted about Secure Platform Funding on the ComplaintWire site. Read the page by clicking here now! 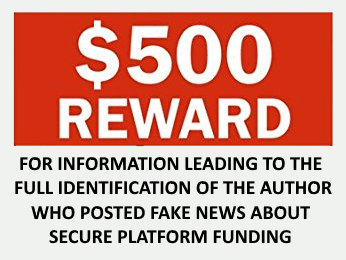 Secure Platform Funding is offering a $500 USD Reward for any person who can provide us with the Full Name, Address, Email and Phone Number of the Author/s that wrote the deliberately fictitious Fake Reviews, Fake Allegations and Fake News about Secure Platform Funding. 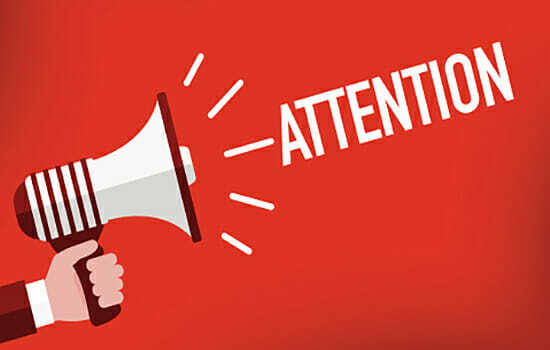 We will pay a $500 USD Reward to ANYONE who can positively identify any Author that has posted false and malicious information about Secure Platform Funding. We believe any person who invests his time manufacturing fairy tales and false information about Secure Platform Funding and then posts this information on the internet deserves thorough acknowledgement and public exposure! If your going to defame others with Fake Reviews, have the decency and the guts to put your real identity and real name! The Police and our Attorneys are very keen to talk to the authors of the Malicious Fake Reviews because Deliberately Posting False Information to Defame and Harm any Innocent company is ILLEGAL! DON'T FORGET: Clients should remember that any clown, competitor, scammer or troll can post information on the internet. But just because someone posts on the internet, doesnt mean their post is real, true, authentic or genuine. Secure Platform Funding has exposed a LOT of scammers and has stood up against the Fakes and Evil in our Industry. The backlash we have encountered has been fierce with scammers, competitors and trolls writing deliberately Fake Reviews. The Below Allegation Responses are the Facts! Allegation 1: Bruce Green has been Arrested, is in Jail and a Trial is in Progress. The Facts: 100% FALSE! Bruce Green has NEVER been arrested for any crime, he isn't in Jail and has never been in Jail, nor is there any trial anywhere for any crime! Bruce continues to work for Secure Platform Funding every day answering client inquiries, talking to customers and performing his normal role as he has for the last many years. Bruce is available to talk to anyone anytime by Phone, Skype, Telegram, Signal or Email. We note that the person who wrote these completely fictitious allegations deliberately provided ZERO EVIDENCE of their allegation! No details of where this imaginary arrest took place, no details of where the trail is, no details of ANYTHING! Just a bunch of FAKE UNFOUNDED ALLEGATIONS with ZERO EVIDENCE AND ZERO TRUTH! 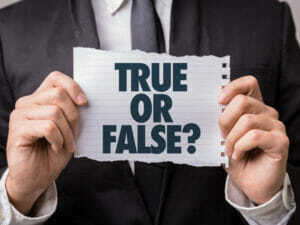 Allegation 2: Bruce Greens real name is Anthony Igbokwe. The Facts: 100% FALSE! Bruce has never met or even heard of any person my the name of Anthony Igbokwe. Secure Platform Funding has never employed any person by the name of Anthony Igbokwe. We would love to know who Anthony Igbokwe is and where his trail is so we can provide that evidence here showing Secure Platform Funding has NOTHING to do with him at all. Allegation 3: Bruce Green has swindled lots of Legitimate Investors. The Facts: 100% FALSE! Since December 2017 all clients who enter PPP, our Managed BG / SBLC Programs or Purchase a Financial Instrument from us have all paid their Transaction Deposit Fees to either an Independent Trustee or Escrow Attorney to ensure the client is completely protected. Secure Platform Funding is a Scam FREE Zone! Allegation 4: Properties worth millions of dollars which is suspected to be acquired from his fraud have been confiscated. The Facts: 100% FALSE! Bruce has never had any property confiscated by any law enforcement authority ever. Where are these properties, where is the evidence of the confiscation? NOTHING EXISTS! Allegation 5: The Person writing these Allegations against Secure Platform Funding and Bruce Green is using a Fake Name! 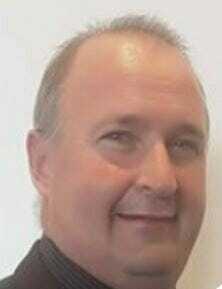 IMPORTANT: If you know the identity of this man who goes under the name of Alexander Harvey, please email us here now! PLEASE HELP US IDENTIFY THE FRAUDSTER IN THIS PHOTO! IMPORTANT: You MUST read our Scammer Allegation Response Page here BEFORE you read the ComplaintWire Responses on this page. The information on the Scammer Allegation Response Page will help you understand the reason why deliberately fictitious and malicious information was posted about Secure Platform Funding on the ComplaintWire site. Read the page by clicking here now!